Pillowcases for college students might be thought of as fairly bland college dorm supplies. After all, what's that exciting about white, basic pillowcases? Not a whole lot. 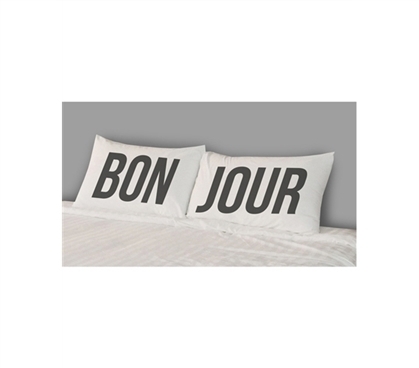 That is, unless you have cool, designer pillowcases like these College Pillowcases - Bon Jour (Set of 2). These cotton pillow cases will really add some fun to your dorm room decorations. Your stuff for college should be fun, after all, because college life will involve plenty of work! Fortunately, you also won't have to be a French major to understand these cheap pillowcases. Since these pillowcases for college are cheap dorm room items, you won't need to spend a lot to give a boost to your college decor. They're also made from cotton, so you know they'll be soft and comfortable. Dorm pillowcases that are cool-looking but not comfortable won't be much good! Since your dorm bedding might very well be the first thing on your college shopping list, make sure you buy all the bedding essentials you'll need. While these pillowcases might be considered dorm accessories, they're essentials for college if you want your dorm room to look as fun as possible!